pineapple recipes. indian pineapple recipes collection. Pineapple is a tropical fruit that is sweet, tart and juicy in flavor. It has a poky appearance due to the skin which has to be removed along with the 'eyes' or the seeds from inside. It is yellow and bright in color and is super delicious! Due to its unique flavor, it is used in a variety of desserts, mocktails and salads all around the world. Pineapples can be used in the crushed, cubed or sliced form. Just having it with a little chaat masala sprinkled on it tastes excellent too! Being such a juicy and tangy fruit, it brings such a different flavor profile to all the desserts it is added to! The forms in which it can be added are many and they list of pineapple desserts is long! The most famous one that I have grown up with is Pineapple pastry which is a juicy Pineapple Sponge Cake alternating with layers of whipped cream. Another interesting dessert is a Coconut Pineapple Mousse, which is a dessert equivalent of the exotic Pina colada with flavors of coconut running through it. Even Indian Desserts are perked up with this exotic fruit. An ordinary sheera can be served as a party starter by converting it into a delectable Pineapple Sheera. Basundi is a dessert made by boiling milk till it thickens and flavoring it with spices like cardamom and cinnamon. Adding grated pineapple to an already great dessert just makes it a 100 times better and makes a unique Pineapple Basundi. Apart from these, there are so many different type of desserts that can be made with pineapple. Pineapple Crumble is a melt in mouth dessert with a twist of crispy muesli served on top, Pineapple Ice cream is creamy and heavy on the pineapple taste and many more! The first thing that comes to my mind when I think of pineapple and beverage together is a refreshing Pina Colada! This exotic mocktail has been had since many, many years and instantly makes you feel like a summer day on a beach! Pineapple Passion is an equally refreshing drink, with added papaya, that is a perfect party starter for any gathering. Pineapple, Banana and Yoghurt Shake is an instant energizer for the mornings. There is no limit to what juices you can make with pineapple and other fruits like mangoes, papaya etc. It is such a diverse ingredient to have in your pantry because you can do so much with it. A combination of salty and sweet is achieved in a tropical Feta Pineapple Sandwich. An absolutely different yet comforting dish is the Layered Potato, Spinach and Pineapple Baked Dish. This special dish has so many elements and even though it might not seem like it, they work in perfect harmony together. Did you know you can even add pineapples to subzis? Pineapple, Capsicum and tomato subzi is a chunky delight with a tangy taste which is has many textures, making it enjoyable to it by all. The best part of this is that it's super easy and hardly takes any time to make. A simple sandwich goes a long way in making one love food and Pineapple Celery and Cottage Cheese Sandwich does exactly that! This cold sandwich can be prepared in a jiffy and has a very likable zestyness to it. Pineapples can be used for sweet as well as savory salads. Mixing vegetables and fruits together already provides a natural mix of different types of flavors and texture together that will blow your mind. Creamy Beetroot and Pineapple Salad mixes the both together in a creamy dressing flavored with mustard powder. A mostly sweet Paneer, Apple and Pineapple Salad makes for an excellent starter or can even be served as a dessert. You can even opt for a Pineapple Bean Sprouts and Veggie Stir Fry instead if you prefer a more savory option. 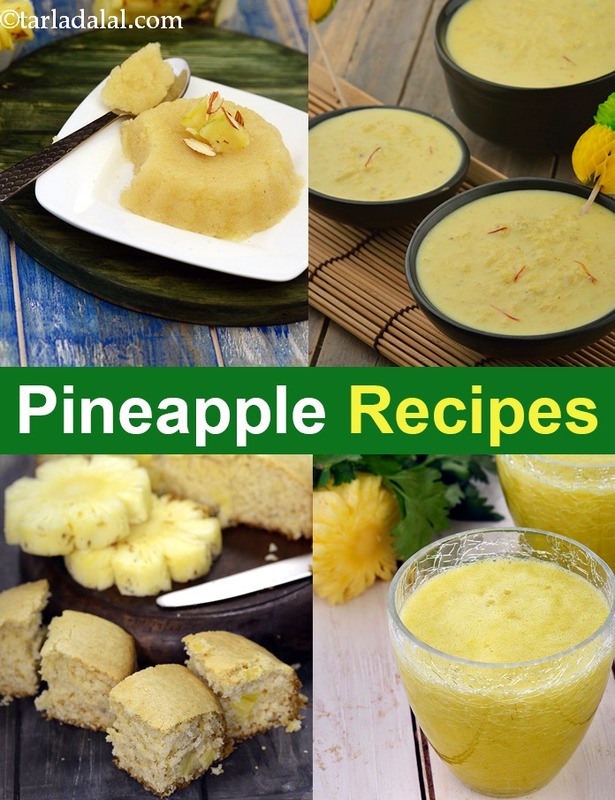 There are so many things that can be made with pineapple and we hoped you like our collection of a few pineapple recipes, indian pineapple recipes collection. Scroll below for more! Here’s a nutritious punch for stocking vitamin a and c stores needed for protecting your eyes and skin from harmful substances causing infections.